WASHINGTON — As president of the American Automotive Policy Council, Matt Blunt is at the centre of negotiations to modernize the 24-year-old North American Free Trade Agreement. The former governor of Missouri closely monitored talks among U.S., Canadian and Mexican trade officials in January in Montreal. 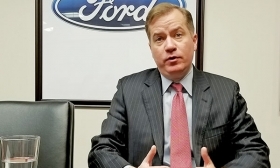 The council represents the Detroit Three, focusing on trade pacts, combating currency manipulation and getting other nations to accept U.S. safety and environmental standards. Blunt, 47, is regularly consulted by the U.S. trade representative and other administration officials for feedback on negotiating proposals and how they would affect the auto industry. He spoke with Staff Reporter Eric Kulisch last week to discuss the latest trade developments. Q:During his State of the Union address, President Donald Trump spoke about how he has helped bring auto manufacturing back to the U.S. Can he take credit for incentivizing domestic auto production? A:There's no question the administration has policies that are favorable to manufacturing. We believe that the regulatory reform the administration is providing as well as some of the tax code changes are indeed beneficial to our member companies and to American manufacturing. [At the same time,] there has been a clear history of commitment to North America and the U.S. over the past recent years. Since 2009, I think, about [$87 billion] has been invested in North America, in the automotive industry. The vast majority of that has been here in the United States. What's the industry's general mood coming out of the Montreal round of NAFTA talks? I would say we're cautiously optimistic. The Canadians put forward proposals, and we were pleased the process is moving forward, that the countries are talking to one another on how they can address some of the U.S. concerns. It doesn't mean we endorse necessarily some of the Canadian concepts, but we think it's important that they are having a robust dialogue. I would say we are probably more optimistic at the completion of this round than we've been in any other round. The main Canadian proposal had to do with rules of origin and calculating areas such as software, engineering and technology that hadn't previously been accounted for. You have reservations? It only means we haven't had time to fully evaluate the proposals. By the Canadians' own admission, they're conceptual. There aren't a lot of details attached to what they put on the table. But we're hopeful the three countries will have a meaningful dialogue about some of the different ideas that are out there regarding the rules of origin. And just to be clear, we think the current rule has worked: 62.5 per cent — it's the highest content requirement of any free-trade agreement anywhere in the world. And we think it sets the right balance to ensure that you don't have free-riders, but that you reward companies that want to produce in the U.S.
Having said that, we're willing to explore new ideas, as long as you strike the appropriate balance. How do you see the schedule going, with the Mexican elections in the summer? I think it's safe to say it's extremely unlikely that they'll wrap this up prior to March. There will be a round at the end of February. Industry will participate in it. Hopefully, between now and then, the three countries can get a better understanding of where they are each coming from on this rule-of-origin issue. You've also made a big point of getting U.S. safety standards applied to free trade agreements. Has that been adopted in the NAFTA technical discussions so far? We've called for inclusion of both a currency provision and strong standards language in the NAFTA. It doesn't necessarily apply today to either Canada or Mexico, but we think it's an important part of the blueprint for future free trade agreements. The U.S. and South Korea just concluded their latest technical discussions on ways to amend their free-trade agreement. What progress is being made? The U.S. negotiators appear to have the right approach, which is, we need to open the South Korean marketplace to our cars. It is a very challenging market. It has a very low import penetration. My understanding is they are trying to address some of these standards challenges that we've faced. ... That products acceptable for sale to U.S. standards be certified as acceptable for sale in Korea. We think that's a great way to cut through a lot of the technical barriers that exist today. And if you do that, and you address currency manipulation, we think you'd be making big steps toward opening the Korean marketplace to American products.